Stainless steel exhaust manifold with T3 flange for the Toyota 2ZZ-GE engine, designed and produced by Radium Engineering. The T3 turbo flange is tapped for M10×1.5 studs (not included). 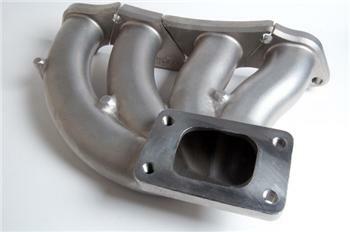 This exhaust manifold was CAD designed and flow analyzed for maximum performance in a compact package. Turbocharger placement was carefully evaluated to make turbo kit installation simple. The turbocharger is located high enough to promote low resistance oil return back into the oil pan, exhaust downpipe easily clears the subframe, and turbocharger air inlet clears the transmission shifter cables. Furthermore, the placement away from the head allows larger radius primary exhaust runners. Manifold mounting holes are designed to allow the manifold to expand without inducing stresses on the fasteners. A casting manufacturing process was chosen for high repeatability suited for volume production without the inconsistencies commonly found with fabricated manifolds. Lost wax (investment) casting process was chosen over a low quality sand casting because of its superior surface finish, tight tolerance holding, and the absence of a parting line. Every manifold is CNC machined to precise dimensions to ensure a perfect fit every time. After casting, there are 3 relief cuts machined into the head flange to separate the exhaust ports, as shown. This allows thermal expansion and resists flange warping. It also relieves and frees up any stress after the part was cooled in the casting process. Next, the head flange and T3 flange is fly cut to be true and flat, as shown. Lastly, four M10×1.5mm threads are machined for mating the T3 turbocharger. 347 stainless steel was used for its high thermal capacity, low thermal conductivity, and resistance to thermal cycling. Additionally, this material will not rust, but will change color when it is heat cycled for the first time. It is highly recommended to use this custom heat barrier designed to keep heat away from sensitive chassis components. Because Stainless Steel will not corrode these manifolds can be polished to a highly reflective “show quality” surface finish.